We Turks love stuffing vegetables. 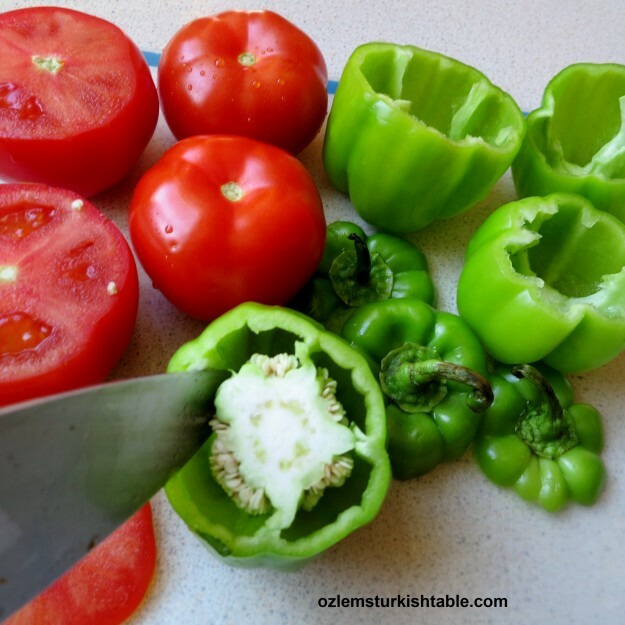 The word dolma is used for the vegetables like aubergines, peppers, courgettes, tomatoes that can be stuffed. I like to save the scooped flesh of the tomatoes and use it in the sauce of the dolmas. Stuffed tomatoes are especially a staple of the summer season when tomatoes are abundant and at their peak. 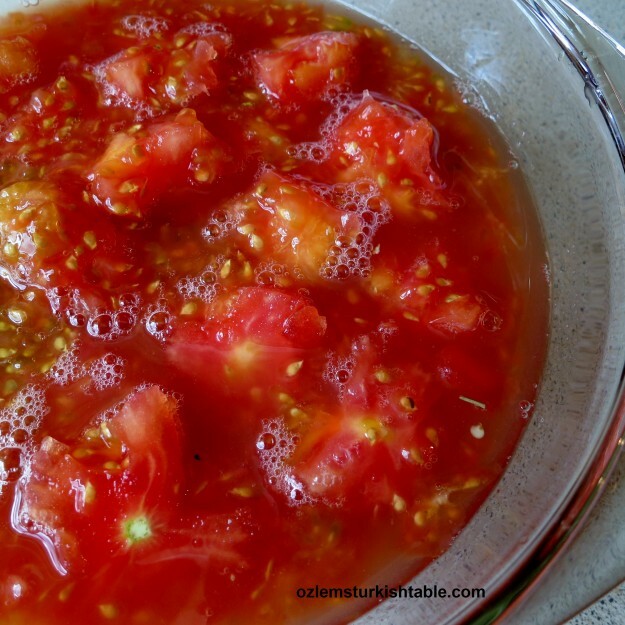 For a richer taste, you can also add red pepper paste, biber salcasi or tomato paste to the sauce. This dish is made from wholegrain basmati rice and it is also gluten-free. I am passionate about our traditional, home cooked all in one pot stews, casseroles, dolmas; not only healthy and delicious, you can make these ahead of time and fantastic for a family meal. 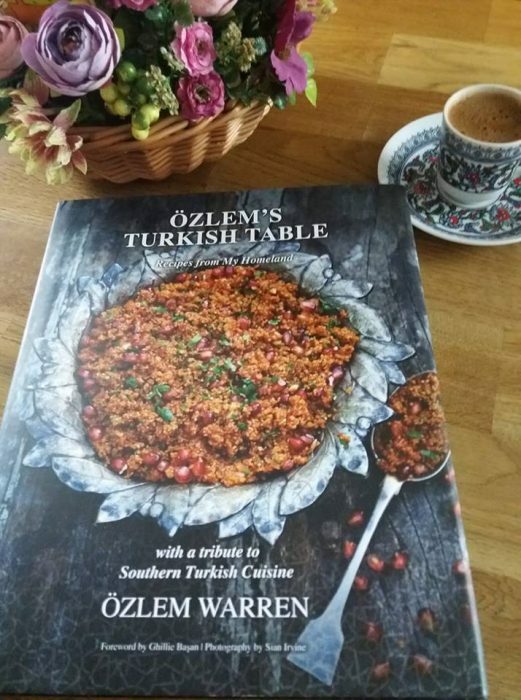 In my hometown Antakya, wholesome bulgur is also used instead of rice in the filling for dolma; varieties of stuffed peppers and tomatoes as well as other traditional Turkish stews and casseroles are included in my cookery book, Ozlem’s Turkish Table – you can order a signed copy for worldwide delivery at this link. Hope you enjoy these dolmas, Afiyet Olsun! Put the ground meat in a large bowl and stir in the rest of the filling ingredients. Season and knead, until all blended well. The filling is ready. Scoop out the seeds of the peppers; save the caps of the peppers and tomatoes. Now, let’s prepare the vegetables. Cut the stalk ends of the peppers and save them aside (we will need them to cap the stuffed peppers later). Scoop out the seeds of the peppers. 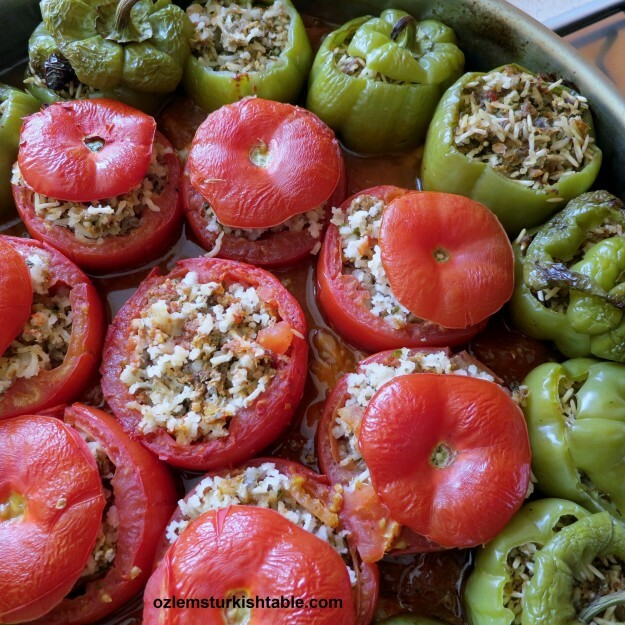 Save the flesh of the tomatoes to go at the sauce of the dolmas, stuffed peppers and tomatoes. Slice the tops of the tomatoes and save them aside. Using a spoon, scoop out the tomato flesh, chop them finely and reserve in a bowl. Take care not to pierce through the skin of the tomatoes. Stuff the tomatoes and peppers with the filling until they are about ¾ full. Take a few spoonfuls of the filling and pack it into the vegetables, until they are about ¾ full. Take care not to overfill to the top, as the rice filling will need some space to expand. Place the stalk ends and tomato tops as lids. 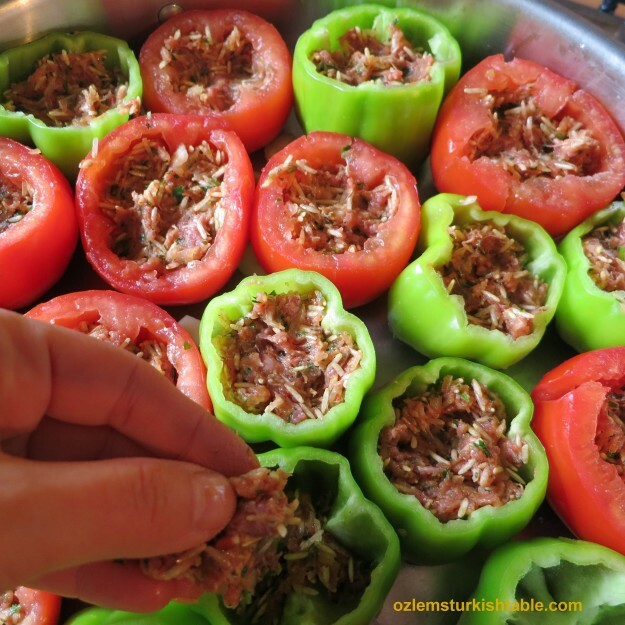 Once cooked, pour a little of the dolmas’ delicious sauce over each stuffed pepper, tomato before serving. Drizzle about 1 tablespoon of olive oil in to a heavy pan. Place the stuffed vegetables upright, packed tightly, in the pan. For the sauce; combine the chopped tomato flesh with 1 tbsp. red pepper paste or tomato paste (if you are using, for a richer taste) and stir in to the pan. Then pour a couple of cups of water around the stuffed vegetables, until it covers just about the half of vegetables. Season with salt and ground black pepper. Stir in the cloves of garlic and cover. Bring the liquid to the boil, then reduce the heat and cook gently for about 45 – 50 minutes or until the vegetables are tender and the filling cooked. Once cooked, I like to take their cap off and pour a little of the dolmas’ delicious sauce over each stuffed pepper and tomato before serving and put their cap back on. Serve hot with plain natural or garlic yoghurt by the side. You can also sprinkle red pepper flakes over the dolmas if you like. 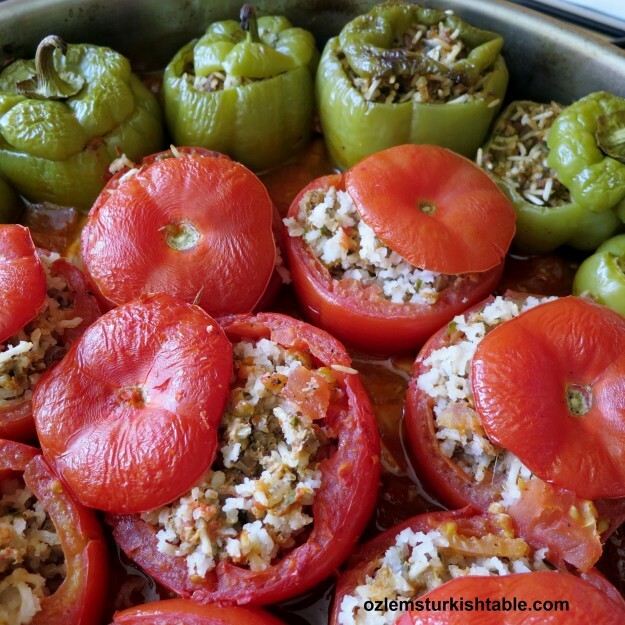 Özlem, these peppers and tomatoes look delicious – you make me hungry! these look wonderful! thanks for the recipe! Your dolmas look magnificient as usual! You made my mouth water! The sight of family gathering around to stuff the dolmas sounds so wonderfully inviting, it took me back to India where cooking is always such a family experience, it’s like Thanksgiving everyday! 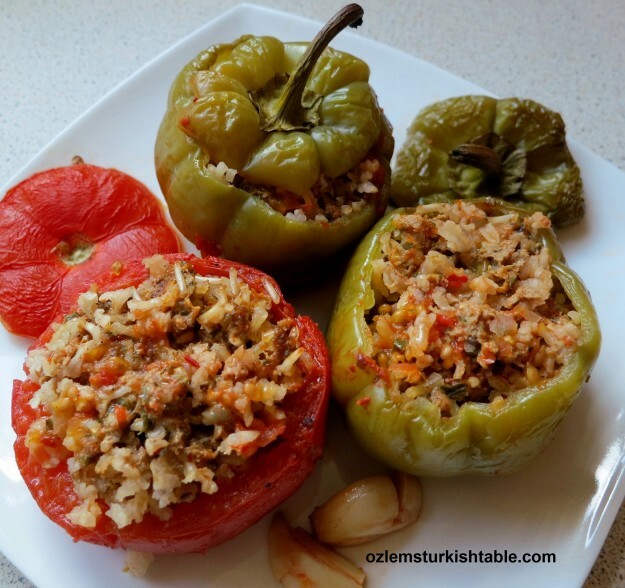 Love the flavors of this dolma, Ozlem, and the fact that the brown rice stuffing cooks in the vegetable, absorbing all its goodness:) xxPeri. I’ve been in Canada visiting family and they are ‘demanding’ Turkish food. I’m so pleased you posted this recipe…let’s hope they enjoy it! I agree with you, best part of the cooking experience for me is that gathering with friends and family; whatever on the table tastes delicious this way. These look absolutely lovely. Stuffed vegetables are definitely one of my favourite things to eat. In fact, my wife made some recently and they remind her of Mediterranean holidays when she was young. To be honest, they remind me of Brixton, which is where I first ate them. Not very exotic, I know. 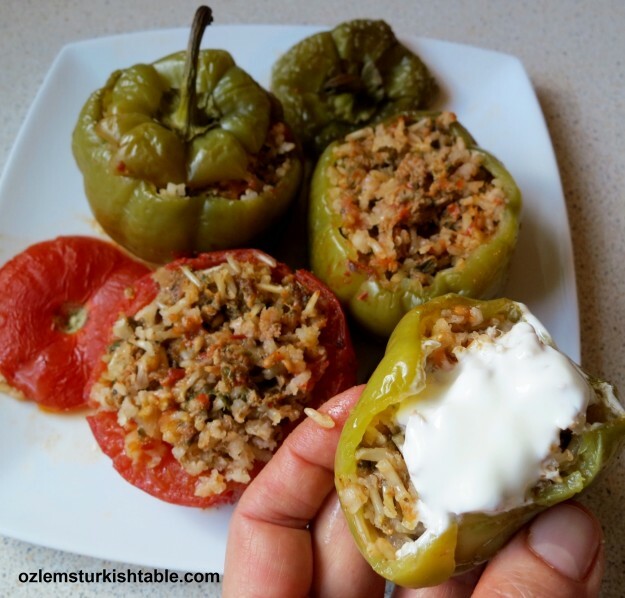 Özlem, Although in the past I have been remiss as a dolma maker, your recipe looks so wonderful and the addition of Basmati rice which I love, has sorely tempted me! In the U.S., I always used the whole grain Basmati but here in Turkey, unfortunately, I haven’t been able to find it. The white will have to do. Your photos are fabulous. I hope this comment arrives. I sent you one earlier but I think it went to the trash. Wow, these look wonderful! I’ve only made stuffed peppers once, and I wasn’t very impressed, but clearly I just needed to find a better recipe. I’ve made tomatoes stuffed with white beans and basil before, which are really nice, but this looks great, too! 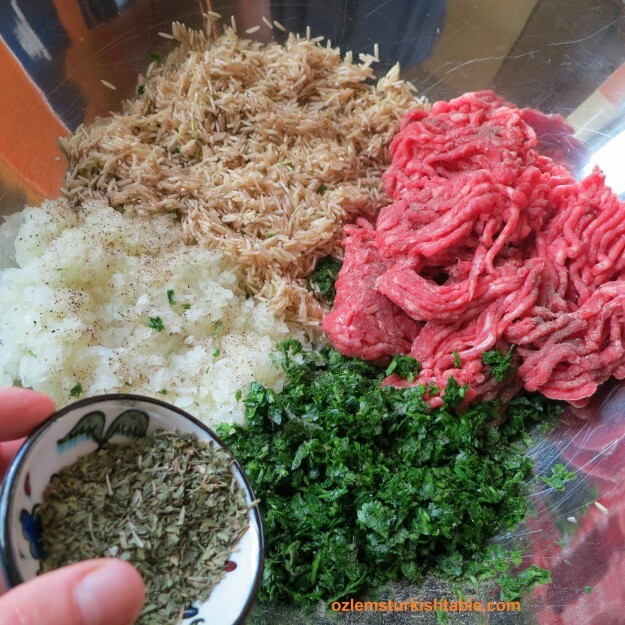 Thanks Allison, worth having a go at these ones; the dried mint and parsley add a lovely flavor to the basmati rice and ground meat, hope you enjoy it! Stuffed vegetables, or dolmas as they are known, have the simplest of ingredients- just wholesome vegetables, rice, sometimes ground meat, herbs and spices. In many recipes, such as this Iraqi one, stuffed vegetables are simmered in tomato sauce, a vegetable which the Spaniards introduced to North Africa and the Turks later incorporated into their cuisine. Cooks soon relied heavily on tomatoes which replaced many of the traditional ingredients in Middle Eastern cuisine such as lemon juice, sour grapes (unripe), sumac liquid, vinegar and sour plums. However, there are still areas where “white sauce” is preferred to the ubiquitous tomato such as my grandmother’s Kurdish stuffed grape leaves whereas in Mosul of Northern Iraq, they prepare it red. This recipe is from the food historian and cookbook author Nawal Nasrallah whose book Delights from the Garden of Eden is a wonderful compendium of recipes, culture, history and folklore of Iraq from the ancient times until today. These look great, but before I make them I have one question – do you put any of the water into the peppers when you cook them, or is it just around them and the rice / meat is cooked by the steam? Growing up in an Armenian household your recipies are very similar to my mom’s cooking. simply delicious. Armenian and all middle eastern food has become very popular with Americans. Bon apetite. I found this recipe and made them last night with a little variation…. I didn’t have parsley so I used some herbs + sumac. This recipe was easy, forgiving and absolutely delicious. Merhaba Loren, so glad you enjoyed this Dolma, your variation sounds delicious – i love the tangy taste of sumac – afiyet olsun! Is the rice cooked before stuffing?